In this article you will learn about the almond tree, how it develops, how it looks like, what type of soil is required for it to grow and much more. First we will start with some general information about the almond tree before we continue to more in-depth information about it such as the soil and climate requirements and what the best way would be to plant an almond tree. The almond tree is a medium sized, upright, deciduous tree that can grow up to 20 to 25 feet tall, its leaves are dark green and have a shape that looks like a lance, they usually are between 3 and 5 inches long. The trunk of the tree can grow up to 12 inch in diameter. The almond tree blossoms in early spring (between January and April) before the leaves emerge, the colors of the blossom vary from white to pale pink and are about 2 inches in diameter, they grow singly or in pairs. The tree is very vulnerable to frost, this is why most of the almond trees are grown in the southern states (such as California) and other warm places such as Spain, Italy, Tunisia, Greece and Turkey. The almonds themselves are actually drupes and look similar to unripe peaches. The almond tree can grow actual almonds after about three years after planting, although it does not have reached it full capacity it still bears fruits. 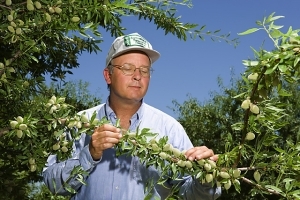 After about 6 years the almond tree is mature, it can keep producing almonds for over 50 years. When the flowers have blossomed the fruits (drupes) start to appear, it takes about 8 months for the drupes to mature, the hull will split open and the almond will be visible. Over 35% of all the almonds in the world are produced in the United States, mainly in the State of California. When you consider buying an almond tree it is not a bad idea to do some thorough research before making such a purchase. In this paragraph we will elaborate on the specific characteristics of the almond tree, in what type of climate it best grows and what kind of soil is required. The native range of the almond tree is mainly the Mediterranean, the almond tree requires full sun to grow. It is not a high-maintenance tree although it is quite vulnerable to plant front (especially the first flowers that blossom during early spring) and plant diseases. Plant disease problems include powdery mildew, black knot and leaf spot. Insects include caterpillars, spider mites, borers and aphids. You can make sure these insects do not attack your almond tree by using pesticides, make sure to use pesticides that are not harmful to humans since you still want to be able to eat the almonds afterwards. The almond tree grows best in well-drained loams which are located in a very sunny area, the tree also grows quite well in sandy soils. It is best to avoid soil that is predominately made up from clay since your almond tree will not grow very well in this type of soil. As far as climate is concerned, the almond tree prefers hot try areas (that is why most of the commercial almond trees are grown in the State of California). The almond tree is also capable of growing in areas where there is not so many sunshine but the nut production will subsequently be less. As we stated in the paragraph before, almonds are technically not nuts but drupes. This is because the almond tree belongs to the rose family, it is closely related to the trees that bear peaches. The almond (we call this the fruit or the seed) is about one to two inches long and hidden inside the exocarp, this is the hard wooden-like shell. The wooden shell grows in the hull, this is a thick leather-like green skin to protect the seeds. When opening the exocarp (the shell that surrounds the edible seed, the almond) you can usually find only one almond nut although sometimes, on rare occasions, you can find two nuts. We can distinguish two kinds of almond trees. One of them produces a more sweet nut that you can safely eat, the one tree produces a more bitter tasting nut that can be fatal when digesting too many. The sweet kinds are of course the ones that you think of when you hear the word almonds. The sweet ones are used in all kinds of products such as butter, ice cream and candy. It is also possible to make oil from it, to learn more about the almond and its uses you can skip to the next paragraph. In this paragraph we are going to make clear what the key differences are between the bitter (inedible) almond and the sweet almond. We will start with the edible almond, the sweet one, also called dulcis. The botanical name for this almond is Amygdalus communis, the almond tree that produces these kinds of almonds belongs to the rose family (N.O. Rosaceae). The United States annually imports over 500 tons of these sweet tasting almonds. There are a variety of different kinds within the type, this is because every almond is grown somewhere else. Most of the US important comes from Malaga, Valentia and Sicily. All these almonds have their own characteristics. For example the Malaga almond is imported without its shell, it is a very large almond with a long shape and a really thin skin. The Valentia almond on the other hand is not as large but broader and not so long. The almonds of this particular almond tree can be used for various purposes, such as cooking, candy and even medical purposes since the oil of the almond can sometimes have a healing effect. The oil made out of the sweet almond can be used as a lubricant and can be found in cosmetic creams, soap and medicine. The shells surrounding the almond can be burned and used for fuel. The bitter almond has the exact same Latin name as its sweet tasting counterpart, the almond tree that produces the bitter kind also belongs to the rose family. There are quite some varieties of the bitter tasting almond, the United States annually imports about 300 tons of them. The almonds themselves are for the most part used for their oil to make almond oil. The bitter almond does not look like the sweet almond at all, it is not as long but broader and smaller, also the taste is (of course) very different from the sweet almond. The oil made from the bitter almond can be used after the poisonous acid has been removed. Oil from the bitter almond can be used a food flavoring and is often used in different types of food (such as cakes), soft drinks, perfume, cosmetic creams and soap. What are almonds used for? Almonds from both almond trees can be eaten in various ways, they can be eaten raw, roasted of blanched. They are also often grinded into other products such as candy bars. 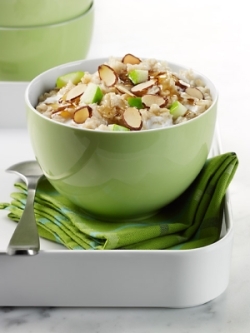 Other types of food that you can find almonds in are (of course) almond oil, flour (as a gluten-free alternative to wheat flour), almond butter, almond milk, muesli, desserts and nougat. As we mentioned earlier, the almond can also be eaten raw, people eat the raw green almond when the almond still has a greenish color and the inner shell has not become hard yet. Especially in parts of the Middle East raw almonds are a very popular snack. We hope that you found this article about the almond tree informative. If you want to learn more about the almond tree you can browse our website to learn more about where almond trees grow, how almonds grow and history of the almond tree. © Growpeanuts.com - All rights reserved.